Vancouver TheatreSports™ League’s (VTSL) The Christmas Queen, in all her nasty glory is returning this holiday season with the latest installment in the series, Christmas Queen 3 – The Bachelorette Edition, running to December 23, Wednesday through Saturday at 7:30 pm. There will also be two additional performances on Sunday, December 18 – a matinee at 2 pm and an evening performance at 7:30 pm. 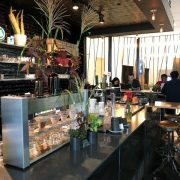 All performances take place at The Improv Centre on Granville Island. This episode of The Christmas Queen saga sees HRM (Her Royal Meanness) as the star of her own reality show. She insists that the finale be filmed and aired live on Christmas Eve and her poor, brow-beaten director Bob Matchit can’t talk her out of it. Not only will his Christmas be ruined but her plan is to ruin the Christmas of all her suitors. Her beaus-in-waiting represent some of the ‘Who’s Who’ of the holiday season – Elf on a Shelf, Jack Frost, Scrooge, The Grinch and even Santa himself are among the many possibilities. Those of you who saw last year’s Christmas Queen 2 will remember that The Queen and Santa have ‘history’ together. Will the flames of passion be re-ignited and melt The Queen’s cold heart? Or will Jack Frost win the coveted rose with his icy demeanour? Perhaps the all-knowing Elf on a Shelf will use his knowledge to coerce The Queen into choosing him. Only the audience knows for sure as VTSL’s ever-resourceful ensemble players take audience suggestions and turn them into 90 minutes of holiday hilarity. No two shows are ever the same thanks to the unpredictable nature of the suggestions and the creative talents of the players. 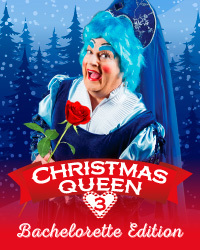 Christmas Queen 3 – The Bachelorette Edition is inspired by British Pantomime (Panto) – a unique theatrical form that itself developed from the much older Italian Commedia dell’arte. British Pantos are traditionally performed during the Christmas and New Year season and always include the character of the ‘Dame’ – a male actor performing an older female role in drag. Our Dame, er Queen, is no exception – in past performances she’s been brought to life by various ensemble members including Nathan Clark, Andrew Barber, Randy Schooley, Brian Anderson and Pearce Visser. “I’ve had so many people tell me they love The Christmas Queen’s irreverent take on holiday traditions and they can hardly wait for the next installment. I expect this year’s version to be even more clever and naughty than the previous ones. It’s a great way to get into the holiday spirit.” comments VTSL Executive Director Jay Ono.